About UCA | Universal Charge Accounts, Inc.
We understand that local retailers provide vital services for friends, neighbors, and their communities. Partnering with UCA means retailers are able to focus on their day-to-day operations, work more with their customers, and offer charge account services for their customers without tying up their time and money. UCA purchases your existing receivables and electronically deposits the proceeds of new in-house charge sales into your bank account every week. Funding is provided for 100% of the face value of your new charges. This service allows you to offer in-house charge accounts without tying up your money, increasing the cash flow of your business. UCA offers comprehensive billing services customized to fit your store’s individual needs. We provide special handling for individual customers. Customer statements are mailed or emailed according to your customer’s preference. Quick credit approval and flexible payment options are available. We help you minimize delinquencies and retain customers while growing your charge account business. We manage the past due receivables for you according to your store policies, from statement messages, reminder letters, to personal phone calls. Focus on your business while UCA does the billing work for you. UCA recognizes that your monthly statement is an excellent way to strengthen and support your store’s image and branding efforts. At no additional cost to you, UCA will customize your statements in order to promote your store. Your store’s logo is prominently displayed, and we include a customized marketing message printed directly on the statements. You can provide the artwork or our marketing team will provide the design for you. Advertise monthly specials, store events and programs, store coupons, or thank your customers for their continued support. Whatever you decide, use your statements as a marketing vehicle to attract and retain customers. 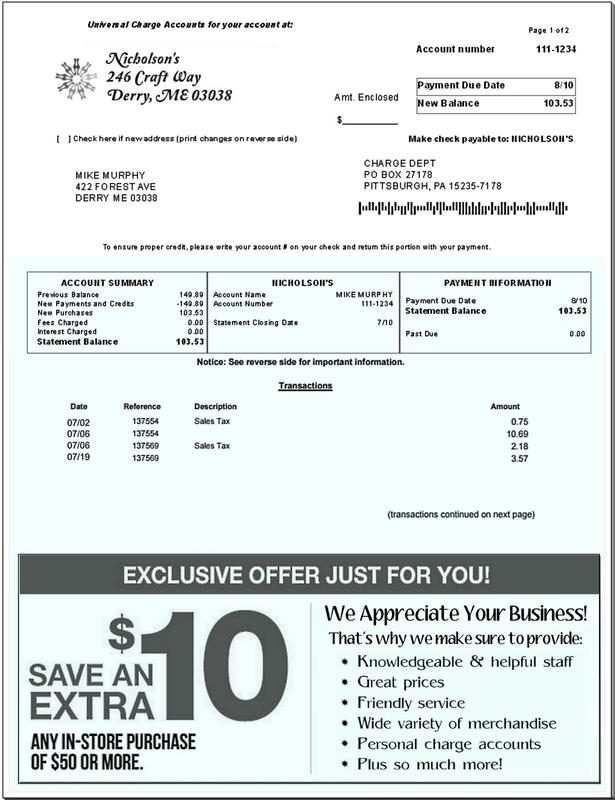 Sample Billing Statement. When you require secure data for transactions and sensitive data, UCA has the server capacity and security to manage your data. UCA adheres to the industry standards and best practices for data management. Your data is backed up, archived, and protected in a secure environment. UCA is HIPAA compliant and provides strict data protection protocols. Our Professional Team includes experienced data, billing, mailing, and marketing specialists as well as a team of IT professionals dedicated to providing top industry support and customer service. Copyright © 2019 Universal Charge Accounts, Inc. All Rights Reserved.